Have you ever known anyone to sit there peacefully and recover from being sick or getting surgery? Me neither. What are you supposed to do all day while letting your body get better? I would go out of my mind. Recently, my sister in law had to have surgery and spend a few weeks taking it very easy and doing a lot of sitting. Sadly, I live too far away to be any real help in the situation, but I decided to address one of the less critical needs...she was bored out of her mind. Definitely some cabin fever setting in. Thus the 'don't go crazy' care package. I've always loved care packages. Who doesn't want to get a surprise box in the mail? Especially when the contents have been hand picked for you. Kind of makes you feel all warm and fuzzy inside. So back to the box...The Lord has blessed me with three of the most amazing sisters in law you could ever hope for. The recipient of this box is an adorable preschool teacher who loves reading, puppies, crafty things, and my brother (aww). 1. Some Teddy Grahams for snacking. She loves these (who doesn't?). 2. An amazon giftcard for a new book to read. 3. A skein of yarn for a crochet project. 4. A penguin needle felting kit. I've never tried needle felting, but it looked cute. 7. A 'to do' list I got at Target for a 1$ - notice all the 'who' blanks are filled in with my brother's name:). Hint hint. Next came the really fun part. Decorations! I wanted the box to feel like a little party when opening it. I wrapped each item with bakers twine and added a note. Then I made a garland from the same bakers twine, a few paper pinwheels, and washi tape flags. Hot glue worked perfectly to fix it inside the lid. I added a paper flower, threw in a note, and sealed it up. 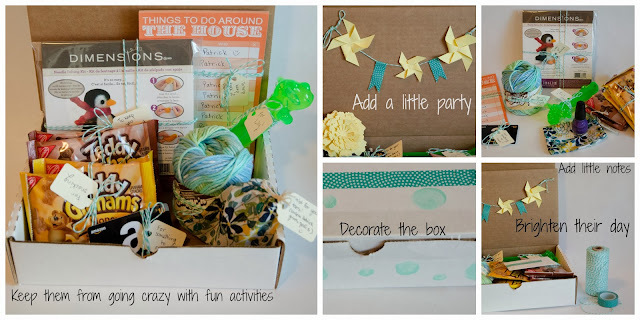 The box looked a little plain so I painted teal polka dots and added more washi tape. Hopefully, it brightened her day and made getting better a little less boring. Like this care package? 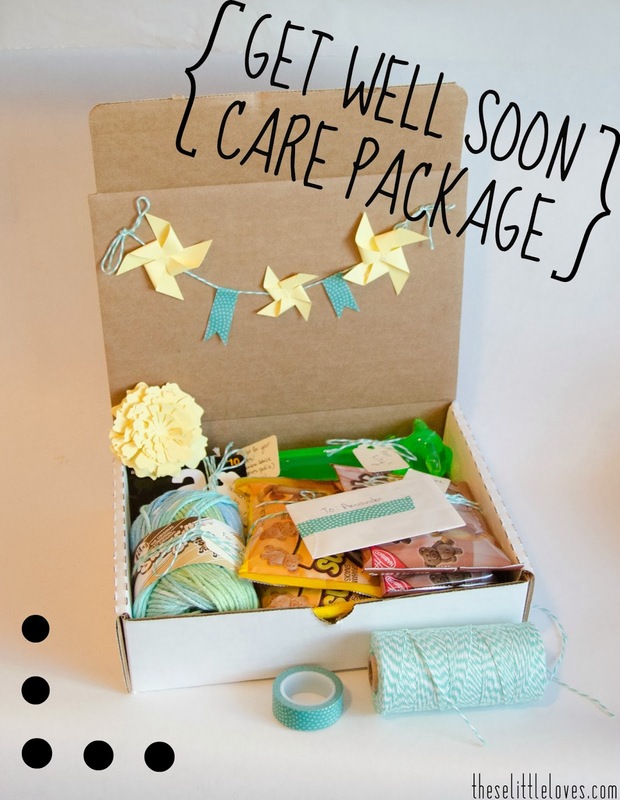 Check out my most recent care package here.